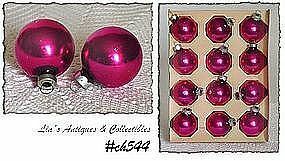 This listing has 1 dozen pink/fuchsia color ornaments that look so pretty on aluminum Christmas trees! These are 1 3/4" diameter, still in their original box -- Noelle, American Made. In very good condition with minor color loss. Pretty!